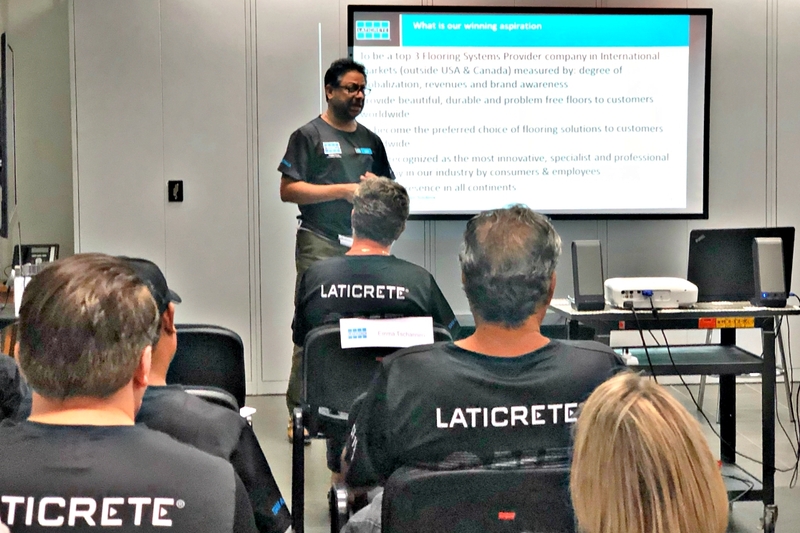 During 2018, ONE LATICRETE ONE TEAM events are being held throughout all LATICRETE global locations where executives of the company come to talk with our team members about the history, success, culture and future growth plans of the company. The main message is that LATICRETE, despite geographical distance, is ‘one’ team with the same vision, mission and values. 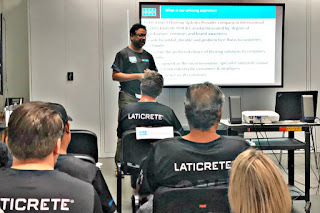 Last week, LATICRETE Australia hosted their event. It kicked off with presentations from Emma Tschannen, General Manager of LATICRETE Australia, Henry B. Rothberg, Sr. Vice President Training of LATICRETE International, and Faisal Saleem, Vice President of LATICRETE International. 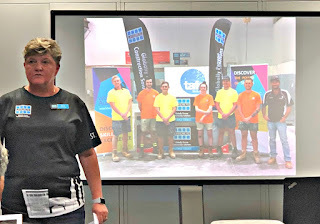 Emma Tschannen, G.M of LATICRETE Australia, welcomed our International guests Henry Rothberg and wife Sheila and Faisal Saleem as well as the Australian team to the One LATICRETE One Family event. The team joined in with Emma to welcome the guests in saying “We are one but we are many, and from all the lands we come, we’ll share a dream and sing with one voice, I am, you are, we are Australian”. Henry B. Rothberg, Sr. VP of Training, then took the team through a series of questions that have been asked: Who are we? What are we going to do to move forward? When did it all begin? He told the story about an innovator and entrepreneur, the late Dr. Henry M. Rothberg, who started LATICRETE in the basement of his family home in the late 1950’s. He spoke about the challenges, the LATICRETE family culture and the future growth plans of the company. Henry thanked each team member for their commitment and spoke about the vital roles that every team member plays in contributing to the success and the growth of LATICRETE. Faisal Saleem, Vice President LATICRETE International, closed the presentation to the team speaking about the future and growth plans for LATICRETE International team including being the leaders in tile and stone as a single source provider of flooring systems from surface preparation, screed and hardeners, decorative, finishes, resinous flooring and complementary products. 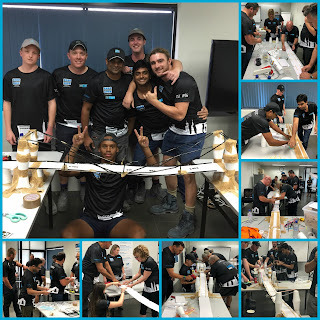 The Australian team then participated in a team build session, called ‘Bridging the Gap’, where they broke off into groups to work together to create a ‘Super Highway’. Teams worked with materials they were given, such as pop sticks (ice-cream sticks), rulers, straws, string, glue gun, polystyrene cups and small cardboard. The goal was to create a ‘Super Highway’ which required bridges to be built between 6 tables, within a period of time. The group had to overcome hurdles which were given to them throughout the challenge, and required the team to adapt, communicate and work together to be successful. The ultimate test was to see if a remote racing car was capable of going across the “Super Highway” and the bridges that were built. The team pulled together and successfully built a “Super Highway” in which the racing car veered through the bridges without any difficulties. 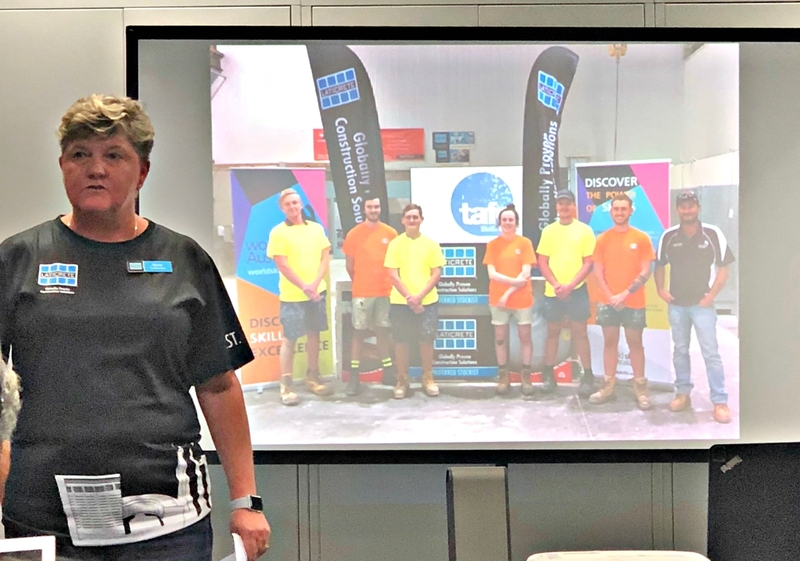 The bridges were all given various International Business Unit names, which symbolised despite geographical distance, LATICRETE is ‘one’ team with the same vision, mission and values. The ultimate challenges through the team build and what every company is faced with on a daily basis is company structure, budgets, communication, team work, procedures and policies. It’s a company’s ability to embrace changes, challenges and adversities to reach the winning goal. 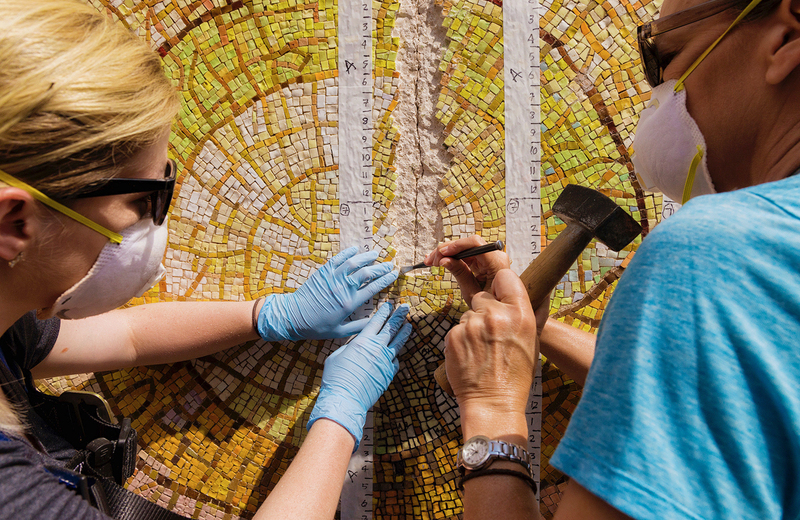 The Genesis Mosaic on the façade of the St. Jude Chapel on Main Street in downtown Dallas was in need of repair to maintain its stability and restore its beauty. MIT professor Gyorgy Kepes’ 1968 mosaic was suffering from two major fractures, smaller cracks, and mildew under the surface. Julie Richey and Cher Goodson put together a team to complete the arduous task. Six weeks after beginning, the Chapel was ready to celebrate its 50th anniversary in 2018. This is an example of the state of the mosaic when we removed the silicone that was added years ago to stop the fallout of tiles. Clear mosaic tape was used to capture the andamento, or pattern of the tile before chiseling to remove tiles surrounding the fracture. Tiles were removed in six-inch sections. The principal players involved in the restoration project: Cher Goodson, owner of Art Restorations of Dallas; Plano mosaicist Lynne Chinn of LCMosaics.com; Reverend Jonathan Austin, St. Jude Chapel chaplain; Julie Richey of Julie Richey Mosaics, and Callie Heimburger, conservator at Art Restorations. We were so fortunate to have a long-time connection with Miotto Mosaics of Carmel, NY. Stephen Miotto is the godson of the founder of Venetian Art Mosaics Studios of the Bronx, NY, and when that business closed, he took over the stock of Italian glass tiles. 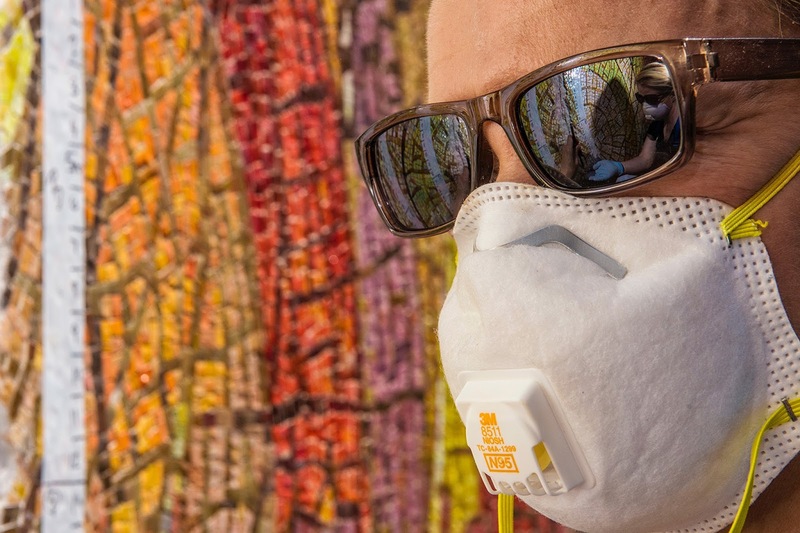 This allowed us to pull colors from the same stock used to make the original mosaic. Venetian Art Mosaics Studios was responsible for several wonderful architectural mosaics created for Dallas institutions in the 1960s. It was understood when we embarked on this preservation project that there were possibly more areas damaged than appeared on the surface. We were disappointed to find a horizontal fracture invisible from the street, which traversed the two vertical fractures. This fracture was treated with the same care as the verticals. Fortunately it wasn't too deep. We removed loose and damaged tiles surrounding the two vertical fractures. 140 distinct colors were counted in these two, thin cross sections. This didn't begin to quantify the colors on the outer reaches of the mosaic: malachite and lime greens, azures, violets, pinks, tangerines, and 24-karat gold leaf tiles. Mildew growing behind the tiles forced many of them to delaminate. The fractures, most likely caused by the building's settling event, then leaked water due to improper flashing on the roof. Now that the roof has been repaired and the mosaic is not subjected to water damage from behind, the fracture is dry. The mildew was neutralized with a bleach gel. An interesting detail of the mosaic was the curve on the southern side of the façade. This area was almost completely covered in 24-karat gold leaf Venetian glass—beautiful—but very thin tile. The mortar here was very fragile. Attempts to prepare the surface for just a few tiles to be reseated resulted in twice as many falling out. We waterproofed the area and made an invisible repair. Once we carefully documented the areas to be removed, cleaned the tiles, and received replacements from the stock at Miotto Mosaics Studios in NY, we were ready to rebuild. Using both printed “before” photos of the mosaic and our iPads and iPhones (for easy enlargement of the details), we were able to identify original tiles and put them right back next to their neighbors. A classic example of ancient craft and modern technology working together. Careful attention to color, shape, and pattern allowed our three “puzzlers” to rebuild the missing sections. The lids served as “trays” for each page of the rebuilt sections. We were fortunate to have a great local rep from LATICRETE International, the company that provided our mortars, grouts, and anti-fracture compounds. In this case, it was HYDRO BAN® waterproofing membrane / anti-fracture fabric to the rescue. We coated the seams with HYDRO BAN® liquid applied waterproofing, then applied thinset and the custom-cut membrane. This provided a stable base for the replacement mosaic, and we are confident that the membrane will keep the old fractures at bay. It takes three to accomplish this task: Callie on the right is working on the thinner fracture; the wider fracture requires a tracker (Lynne on the left) and a fixer (Julie in the middle) to keep the tesserae and patterns in line. Highly detailed photos allowed the team to ensure the exact tiles, based on their characteristics, were put back in place. Conservator Callie Heimburger created a special “wash” of Indian red and burnt umber to unify the design by coloring joints and mortar to match the intensity of the glass tesserae. This process was used in the installation of the original mosaic in 1968. We know this because we found traces of the pinkish-red stain under the loose tiles. Once the replacement of tiles along the fractures was complete, it was time to spot-grout low areas, and clean and replace randomly missing tiles across the façade. Texas artist Julie Richey has been making mosaics for more than 20 years, creating custom residential and commercial installations in the US, Italy, Spain, and Mexico. 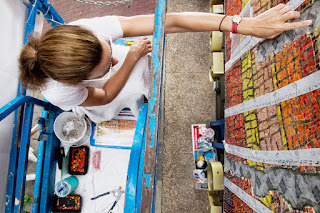 Her mosaics and sculptures have been exhibited across the US and in Italy at the biennial Ravenna Mosaico Festival and at the Orsoni Smalti Veneziani Foundry in Venice as part of the Orsoni Grand Prize for Mosaic in 2009.